1941. That was the year we saw the attack on Pearl Harbour, Joe DiMaggio's 56-game hitting streak begin and end, the first Jeep was built and Mount Rushmore was completed. Also, that was the year that both my father and father-in-law were born. Yes, that makes them both the ripe ol' age of 70. With such a significant milestone, going out for dinner is a must. For my father-in-law, we all decided that a good Chinese meal would fit the bill. Despite my suggestions on a few restaurants in Richmond (yes, you heard right...), it was decided we would eat in Vancouver. 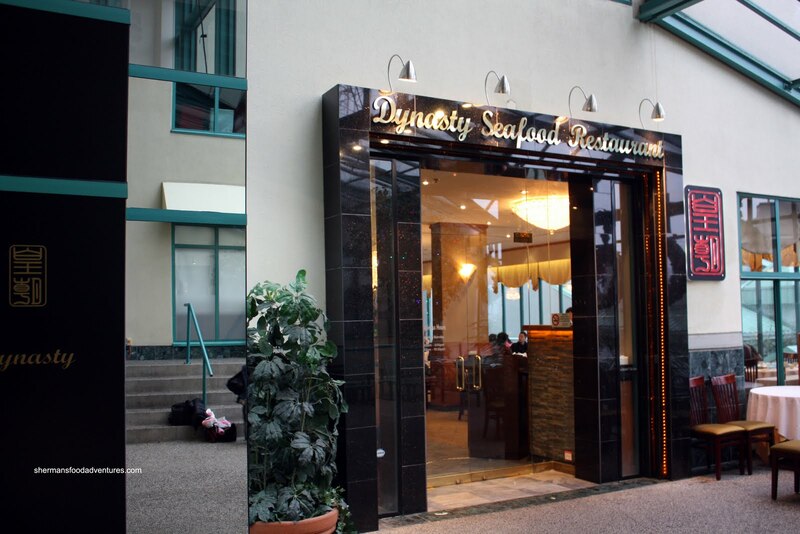 Trying to go for more of an upscale establishment, we settled on Dynasty. We've been here for Dim Sum in the past, but that is never a good indication of what dinner service would be like. Usually, there are 2 separate chefs who handle Dim Sum and dinner. We ended up ordering the mid-range set dinner menu which would normally be seen at a wedding or baby one-month. 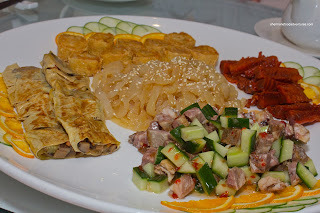 We started with the requisite Appetizer Platter consisting of mock goose, fried fish cakes, smoked fish, marinated jellyfish and cucumbers & brisket. The one word to describe this platter would be "sugary". The smoked fish was very sweet while the texture was a bit so ft. The jellyfish was good, not being watery and having the right amount of seasoning. 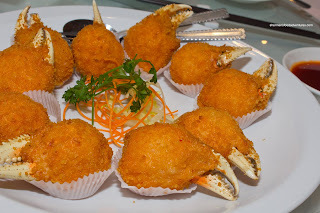 The fried fish cakes had a nice bounce texture, yet the big chunks of pork fat was not that appealing. The mock goose, or shiitake wrapped with fried bean curd skin, was sweet as well. It did have a nice chewy texture though. Although the cucumbers in the "salad" were crunchy and flavourful with some kick, the fatty pieces of meat were not. 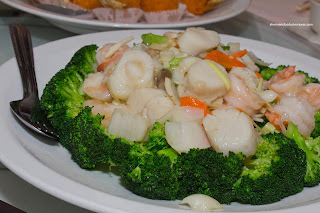 Next up was the Stir Fried Scallops & Prawns on a bed of broccoli. This was a well-prepared dish with v ibrant crunchy broccoli florets and big scallops and prawns. The dish was very mildly seasoned, yet that was understandable since the scallops and prawns have a natural sweetness of their own. 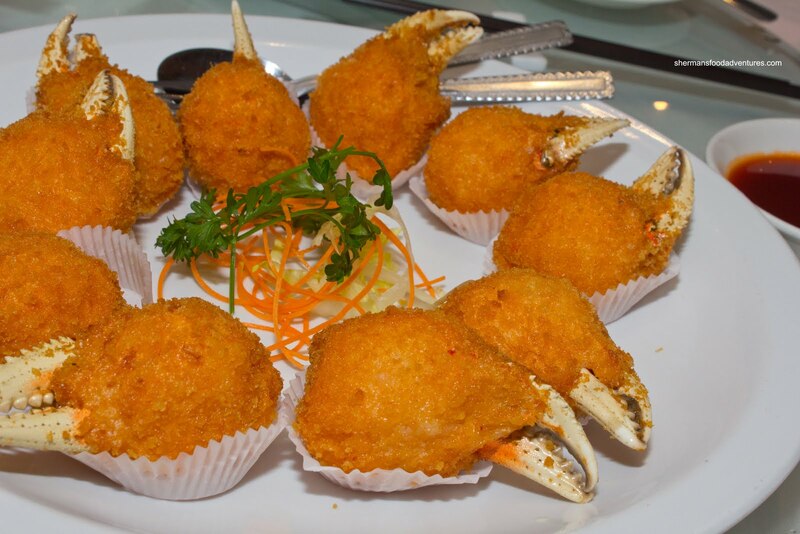 The ever-so-popular Stuffed Crab Claws arrived next and these were executed very well. The exterior was lightly crisp and not-too-oily while the shrimp mousse inside had the desired bounce texture. My only gripe would be the blandness of the mousse itself. I do realize that the sweet n' sour sauce would somewhat help to alleviate this problem, yet it should not depend on it. Now for somew hat of an official announcement. 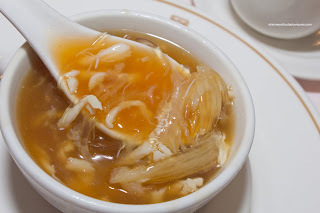 After careful consideration and reflection, I have personally chosen to not eat Shark's Fin Soup anymore. However, I am not going to preach about it. People can do whatever they want, this was just a personal decision. Therefore, I can only go off of what others at my table thought about it. As you can clearly see, there was a heck of a lot of shark's fin. Furthermore, they didn't skimp on the crab and chicken meat either. As for the soup base, it was silky smooth and exhibited depth from the consume. A well-balanced shark's fin soup. Next up, we had the Crab and Lobster in consume. Okay, I gotta get this off my chest first (and it ain't my pathetic amount of chest hairs... TMI?). 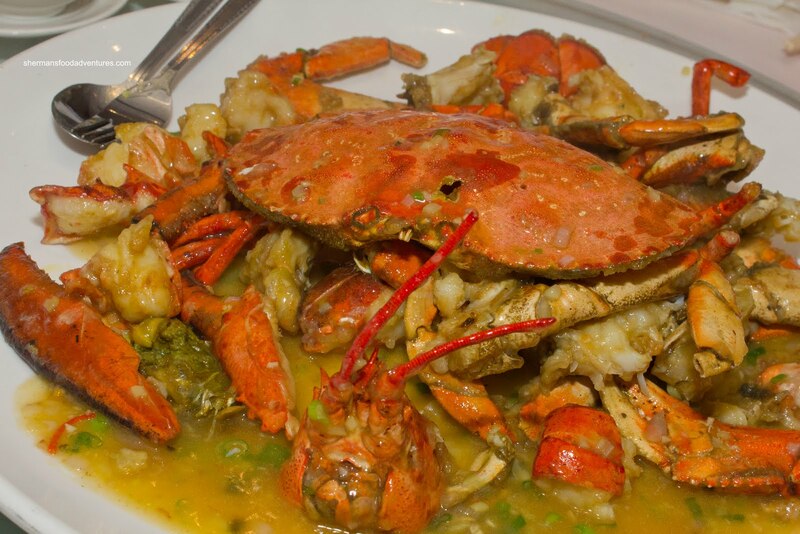 These were 2 of the puniest crab and lobsters we've ever had in this type of dish. Either they were clients of Jenny Craig or they belonged in a circus act. Both were skinny and small. Nothing particularly wrong with the preparation, although the lobster was a bit overcooked. The sauce was a touch salty. For our fish course, we had the Stir-Fried Basa atop baby bak choy. Unfortunately, this was an uneven offering. 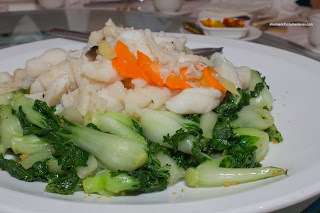 The bak choy was perfectly executed being crunchy while fully cooked. However, the basa was overdone and in fact, falling apart. As you can clearly see in the picture, most pieces were in little bits. This also could've been the result of too much tossing in the wok. Arriving next was the Sea Cucumber with shiitake mushrooms and pea shoots. 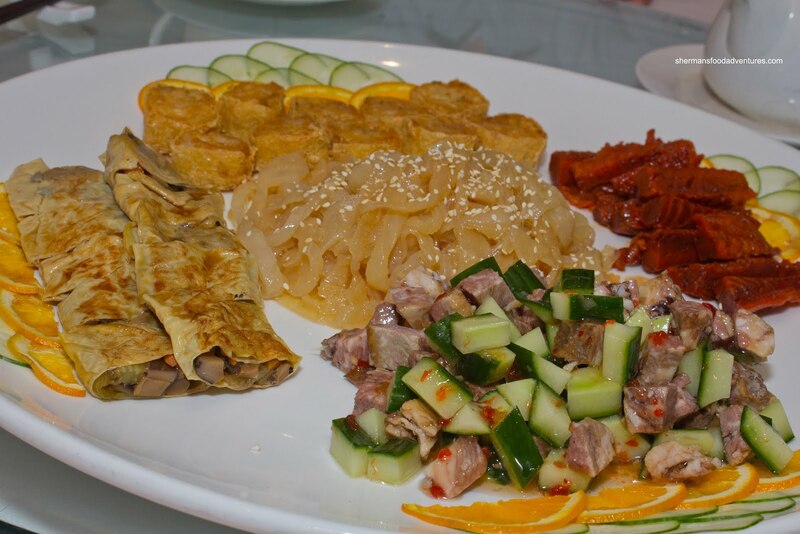 Unlike the usual preparation of this dish, which has the sea cucumber sliced into pieces, it came whole. That made for an interesting picture though. Look at it. Doesn't that look absolutely phallic? I wouldn't blame someone who has never eaten sea cucumber before not wanting anything to do with it. It reminded me of the time I ate with some people who had never tried it. They had originally looked at the menu and thought they were getting veggies. I had to explain that it was not a form of cucumber, rather it was a sea slug of sorts... Give them kudos for eating it. So, to retain its shape without melting way braising, compromises had to be made. 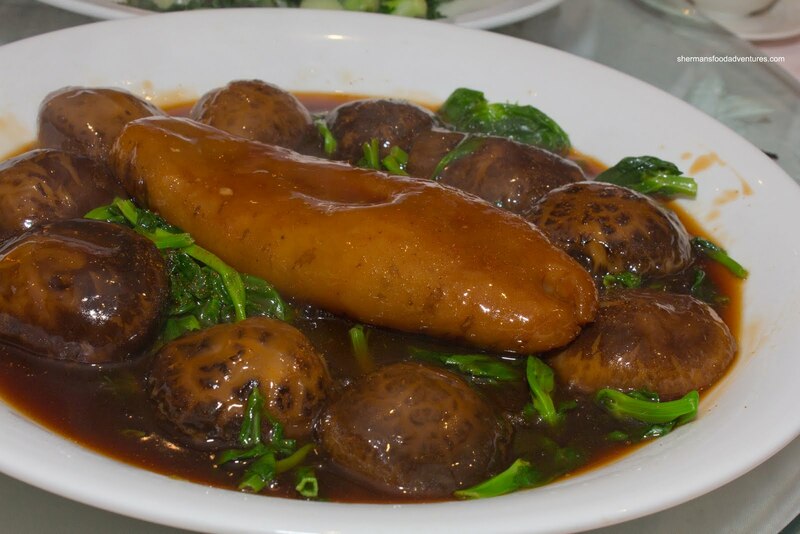 Hence, the sea cucumber was more "stiff" than usually prepared... ahem... That wasn't exactly to my liking because I like it soft. OMG. I'll stop now. If you are familiar with this type of banquet menu, you know that the fowl dish was next. 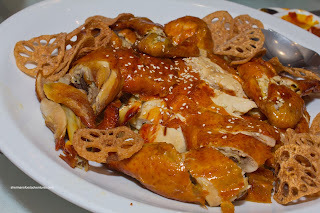 We ended up with the Fried Chicken with lotus root chips. The chicken skin was crisp and rendered down while the meat was sufficiently moist and well-seasoned. The lotus chips were something a bit different and I give them kudos for that. The original rice dish for this menu was their Pumpkin Seafood Rice and I got them to substitute it with the Lovebird's Rice. Why? Well, the last time we had the pumpkin rice, I thought it was pretty awful. As for the replacement, the actual name in Cantonese if carried over to English would not be Lovebird's Fried Rice. Rather, it would be Ying Yang Fried Rice. Normally, the red and white sauces would be presented much like a ying yang symbol. Overall, the rice was fine, but honestly, did they really need to put so much onion on the red sauce side? That's all we could taste. And that pretty much sums up the dinner we had here. It was alright, yet for the price, we were expecting more. Service was top-notch as usual though. I think it's good that you're not eating shark fin for ethical reasons. I'm not going to lie, the day that they start using sharks for all their body parts, I'll be jumping back in on it, but for now I don't see it as an enhancer of food. Thanks Vincent. That's exactly how I feel about it too! They actually eat smoked shark in Jamaica... which I liked. However I'm not a shark's fin eater either. 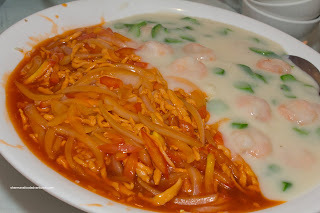 Until the whole shark is used AND the shark's fin proves to have a nutritious aspect and flavour I will consider it... but it has zero nutritional content and tastes like nothing so it's really just a delicacy/texture thing... in which case go for the clear vermicelli noodles. Sorry to rant on ur blog sherman. @Mijune Well said. Same boat. If they eat the whole shark, go for it, otherwise, none for me.